Purpose: The aim of this ex vivo study was to compare the accuracy of radiographic and electronic root canal length determination methods, compared with actual root canal length obtained with stereomicroscope. Materials and Methods: Thirty extracted single-rooted permanent teeth were used for this study. After access preparation, actual length (AL) of the root canal were determined for each tooth by inserting a #15 file until the tip of the file was visible at the apical foramen under a stereomicroscope. The radiographic working length determination was determined with a digital radiographic system and for the electronic measurement all teeth were embedded in an alginate model to test apex locator in-vitro. Data was analyzed using the descriptive statistic and intraclass correlation coefficient. Results: No significant difference was found between the radiographic and electronic root canal working length determination (P>0.05). 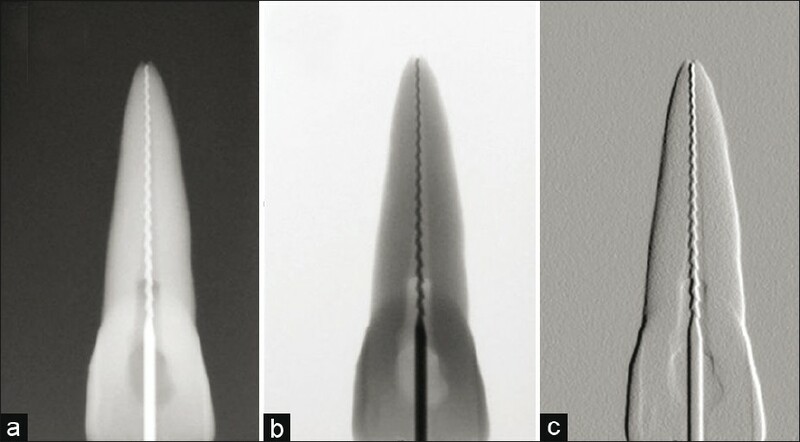 The percentage of electronic measurements within ±0.5 mm to the apical constriction was 93.34% and 90% for radiographic methods within ±0.5 mm of all cases compared with AL. Conclusions: The present ex vivo study showed that electronic root canal working length determination is not superior to radiographic methods. Both methods provided a good performance in determining the root canal working length. Accurate working length determination is a crucial factor that influences the outcome of root canal therapy. ,, Techniques for determining the root canal length must give reproducible precise results. Root canal length determination is commonly performed using tactile sensation, radiographic methods or apex locators. Traditionally, radiographic working length is the standard measure for endodontic instrumentation and to evaluate the subsequent obturation of the root canal system. , However, all of these methods have limitations. Tactile sense and radiographic methods for the determination of the root canal length may be ineffective in this regard. The concept that working length of root canal can be determined using an apex locator began in 1942, and was described by Suzuki,  whereas the electrical resistance between the periodontal ligament and the oral mucous membrane was described by Sunada in 1962. The distance from physiologic foramen to anatomic foramen of the root canal ranges from 0.5 mm to 1 mm. ,, The first and the second generation of apex locators were not stable and accurate in a canal filled with an electrolyte. Third-generation devices have shown that accurate measurements could be obtained even in the presence of electrolytes, and with accuracy between 85% and 95%. ,, These units have more powerful microprocessors and are able to process the mathematical quotient and algorithm calculations required to give accurate readings. The fourth-generation apex locators are based on the new multi-frequency principle and measured directly and independently during use. The aim of this in vitro study was to compare the accuracy of radiographic and electronic canal length determination methods. Thirty extracted single-rooted permanent teeth with mature apices were used for this study. Before the test, the teeth were stored in a formalin solution 10% then stored in 3% sodium hypochlorite for 2 weeks to clean of extraneous tissue and calculus. A standard access cavity was prepared with a high-speed fissure bur and water. The pulp tissue was removed with a barbed broach. After access preparation, the AL of each root canal was determined. A #15 file (Dentsply Maillefer, Ballaigues, Switzerland) with a silicon stop was inserted into the root canal until the tip of the file was visible at the apical foramen under a stereomicroscope (Olympus SZX 12, Hamburg, Germany) at a magnification of ×12. The distance of the silicone stop to the file tip was measured with a millimetre ruler, then subtracted 0.5 mm from the measurement and registered as the AL. After AL determination, the radiographic working length was determined with a digital radiographic system (Sirona Dental Systems GmbH, Bensheim, Germany). Two radiographs were taken for each tooth by using the parallel technique. The first radiograph was taken to determine the radiograph tooth length, which is defined as the distance between the coronal reference and the radiographic apex; and, second radiograph was taken to determine the radiographic working length. , For radiographic working length determination a #15 file (Dentsply Maillefer, Ballaigues, Switzerland) with a silicon stop was inserted into the root canal, and then 1 mm was subtracted from the measurement registered as the radiograph tooth length [Figure 1]. For the electronic measurement all teeth were embedded in an alginate model (Alginate Plus, Henry Schein, Melville, NY USA) to test apex locator in vitro. The alginate was poured into a plastic box, the teeth were embedded and the lip clip electrode of the Root ZX (J.Morita Corp., Tokyo, Japan) apex locator was inserted in alginate prior to its setting. Before using the electronic devices, the canals were rinsed with 3% sodium hypochlorite and relatively dried with a paper point (VDW GmbH, Munich, Germany). For electronic measurement of the canal length, a #15-file (Dentsply Maillefer, Ballaigues, Switzerland) connected to the Root ZX apex locator and the working length was determined according to the manufacturer. After this the instrument was marked with a silicon stop and measured using a millimetre ruler. Definitively all measurements were compared with actual canal length as a reference standard method. Data were analyzed using the descriptive statistic and ICC. The mean of absolute differences between radiographic and electronic measurement compared with AL are presented in [Table 1]. The cases and percentage values of radiographic and electronic canal measurement are given in [Table 2]. The percentage of measurements within ±0.5 to the apical constriction was 90% for radiographic and 93.34% for electronic measurement. The measuring accuracy was similar for both methods, no significant statistical differences were found (P=0.643). 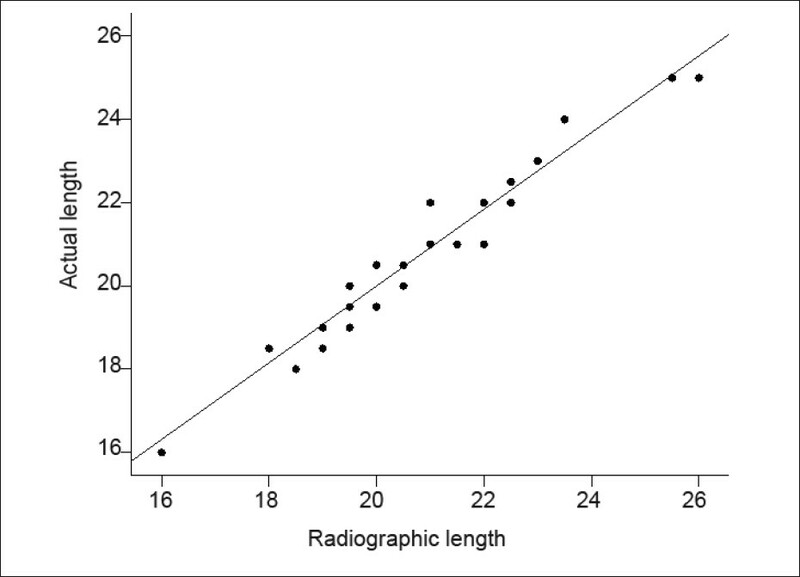 The ICC values for the radiographic methods were 0.972 and 0.985 for electronic methods and the results were visualized with Scatter plot [Figure 2] and [Figure 3]. Working length determination has been discussed in previous publications with contradictory results. 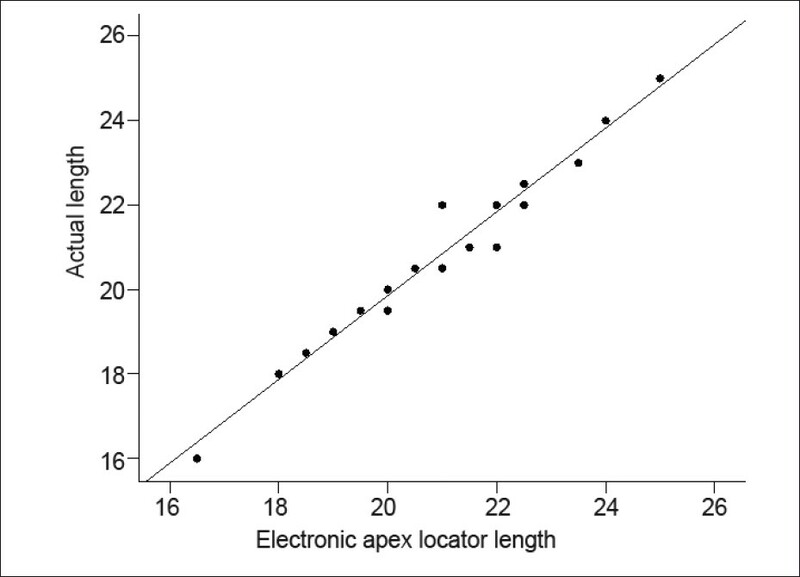 Some authors reported better results obtained with apex locator, and others found no differences between radiograph and electronic methods for working length determination. ,, It has been reported that the electronic method for working length determination was satisfactory in 67.8% of cases, versus 50.6% and 61.4% for the conventional and digital radiological methods. None of the techniques were completely satisfactory in establishing the true working length and no differences were between the techniques investigated,  whereas the study of Pommer  showed that electronic root canal length measuring device provided significantly more accurate results than the radiographs. In contrast to this, the present in vitro study showed that electronic working length determination is not superior to digital radiological methods and this consist with the results of study from Martinez-Lozano et al. Mello-Moura  reported that the electronic working length determination gives the best performance compared with others methods, but the combination of radiographs and tactile sense methods provided good results and can be an alternative when electronic resources are not available. Apex locators have been widely studied in vitro using different mediums, such as agar, gelatine or alginate and in the presence of various canal fluids. ,,,,,,,,,,,,,,,,,,,,,,, In this study, the alginate model was used for testing of apex locators in vitro. Different modern apex locators are available for electronic root canal length determining. The Root ZX apex locator showed more precise measurements compared with other apex locators in several studies. ,,, For this reason the Root ZX Apex locators were used in this study for electronic measurement of root canal length. In this study, the Root ZX apex locator gave precise and accurate measurements; however, is not superior to digital radiograph methods. Both, the radiograph and electronic testing methods were similarly accurate in the root canal working length determination. The use of the apex locators is comfortable and quick; however, apex locators used alone without the radiographic method cannot give any information about the curvature and direction of the root canal. 1. Steffen H, Splieth CH, Behr K. Comparison of measurements obtained with hand files or the Canal Leader attached to electronic apex locators: An in vitro study. Int Endod J 1999;32:103-7. 2. Ricucci D. Apical limit of root canal instrumentation and obturation, part 1. Literature review. Int Endod J 1998;31:384-93. 3. Kaufman AY, Keila S, Yoshpe M. Accuracy of a new apex locator: An in vitro study. Int Endod J 2002;35:186-92. 4. Ounsi HF, Haddad G. In vitro evaluation of the reliability of the Endex electronic apex locator. J Endod 1998;24:120-1. 5. Seidberg BH, Alibrandi BV, Fine H, Logue B. Clinical investigation of measuring working lengths of root canals with an electronic device and with digital-tactile sense. J Am Dent Assoc 1975;90:379-87. 6. Bramante CM, Berbert A. A critical evaluation of some methods of determining tooth length. Oral Surg Oral Med Oral Pathol 1974;37:463-73. 7. Stein TJ, Corcoran JF. Radiographic "working length" revisited. Oral Surg Oral Med Oral Pathol 1992;74:796-800. 8. Subramaniam P, Konde S, Mandanna DK. An in vitro comparison of root canal measurement in primary teeth. J Indian Soc Pedod Prev Dent 2005;23:124-5. 9. Suzuki K. Experimental study on iontophoresis. Japanese J Stomatol 1942;16:411-29. 10. Sunada I. New method for measuring the length of the root canal. J Dent Res 1962;41:375-87. 11. Kuttler Y. Microscopic investigation of root apexes. J Am Dent Assoc 1955;50:544-52. 12. Grove CJ. A new simple standardized technique producing perfect fitting impermeable root canal filings extended to the dentinocemento junction. Dent Items Interest 1928;50:855-7. 13. Green D. Stereomicroscopic study of 700 root apices of maxillary and mandibular posterior teeth. Oral Surg Oral Med Oral Pathol 1960;13:728-33. 14. Fouad AF, Krell KV, McKendry DJ, Koorbusch GF, Olson RA. Clinical evaluation of five electronic root canal length measuring instruments. J Endod 1990;16:446-9. 15. Fouad AF, Rivera EM, Krell KV. Accuracy of the Endex with variations in canal irrigants and foramen size. J Endod 1993;19:63-7. 16. Frank AL, Torabinejad M. An in vivo evaluation of Endex electronic apex locator. J Endod 1993;19:177-9. 17. Kobayashi C. Electronic canal length measurement. Oral Surg Oral Med Oral Pathol Oral Radiol Endod 1995;79:226-31. 18. Gordon MP, Chandler NP. Electronic apex locators. Int Endod J 2004;37:425-37. 19. Plotino G, Grande NM, Brigante L, Lesti B, Somma F. Ex vivo accuracy of three electronic apex locators: Root ZX, Elements Diagnostic Unit and Apex Locator and ProPex. Int Endod J 2006;39:408-14. 20. ElAyouti A, Weiger R, Löst C. Frequency of over instrumentation with an acceptable radiographic working length. J Endod 2001;27:49-52. 21. ElAyouti A, Weiger R, Löst C. The ability of root ZX apex locator to reduce the frequency of overestimated radiographic working length. J Endod 2002;28:116-9. 22. Tinaz AC, Alacam T, Topuz O. A simple model to demonstrate the electronic apex locator. Int Endod J 2002;35:940-5. 23. Pommer O. In vitro comparison of an electronic root canal length measuring device and the radiographic determination of working length. Schweiz Monatsschr Zahnmed 2001;111:1165-70. 24. Mello-Moura AC, Moura-Netto C, Araki AT, Guedes-Pinto AC, Mendes FM. Ex vivo performance of five methods for root canal length determination in primary anterior teeth. Int Endod J 2010;43:142-7. 25. Martinez-Lozano MA, Forner-Navarro L, Sanchez-Cortes JL, Llena-Puy C. Methodological considerations in the determination of working length. Int Endod J 2001;34:371-6. 26. Aurelio JA, Nahmias Y, Gerstein H. A model for demonstrating an electronic canal length measuring device. J Endod 1983;9:568-9. 27. Donnelly JC. A simplified model to demonstrate the operation of electronic root canal measuring devices. J Endod 1993;19:579-80. 28. Katz A, Kaufman AY, Szajkis S. An in vitro model for testing the accuracy of apex locators. Revue Francaise D´endodontie 1992;11:67. 29. Weiger R, John C, Geigle H, Lost C. An in vitro comparison of two modern apex locators. J Endod 1999;25:765-8. 30. Ounsi HF, Naaman A. in vitro evaluation of the reliability of the Root ZX electronic apex locator. Int Endod J 1999;32:120-3. 31. Venturi M, Breschi L. A comparison between two electronic apex locators: An in vivo investigation. Int Endod J 2005;38:36-45. 32. Jenkins JA, Walker WA 3 rd , Schindler WG, Flores CM. An in vitro evaluation of the accuracy of the root ZX in the presence of various irrigants. J Endod 2001;27:209-11. 33. Guise GM, Goodell GG, Imamura GM. In vitro comparison of three electronic apex locators. J Endod 2010;36:279-81. 34. Pineda F, Kuttler Y. Mesiodistal and buccolingual roentgenographic investigation of 7,275 root canals. Oral Surg Oral Med Oral Pathol 1972;33:101-10.